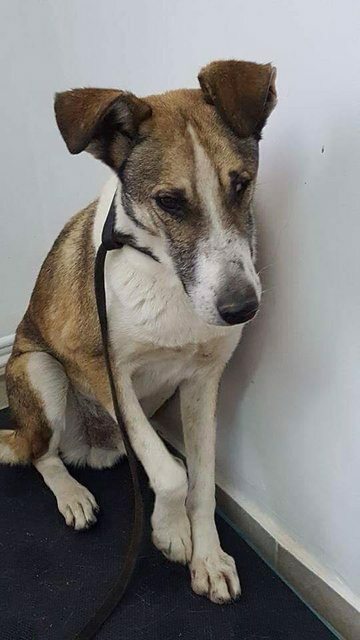 Sam is a 10 year old male Cross-Breed. 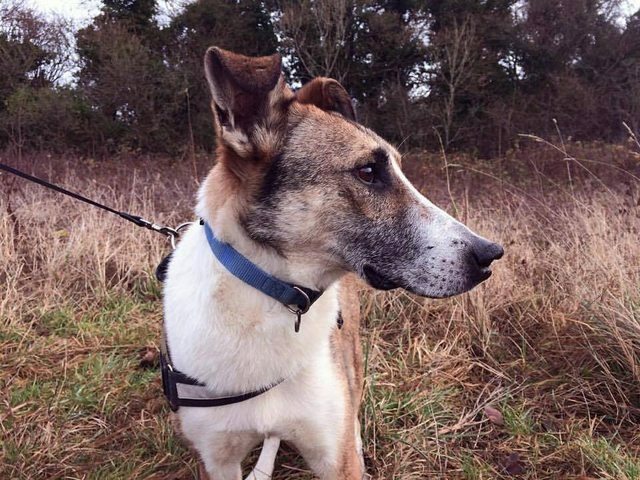 Sam was found in a Shelter in Romania along with Sari, where he had been for some time. He has one damaged eye, but is fully sighted in the other. Sweet Sam is now in UK foster care, this is what his foster parents have to say about him! Being an older gentleman, Sam has decided a life of comfort is most definitely the life for him….oh yes indeed….And who can blame him after the terrible life he’s had so far, Sam is certainly making up for lost time! Sam adores warmth and softness, human beds, sofas, soft dog beds, blankets – you name it. Sam can’t get over the fact he is now always warm and comfortable, and he shows his pleasure by rolling on his back and grunting, snoring, and enjoying a fuss from his foster Mum. Poor Sam has a fear of strange men and he’s learning not to fear his foster Dad and will now accept affection from him but he’s understandably wary although he is improving all the time. Because of this fear, his forever family will need to be exceptionally patient and understanding with him until he learns there is now no longer anything to fear from men. Sam’s foster parents think he might in fact be a bit younger than 10 years as he certainly has the energy of a younger dog! This poor boy unfortunately bears lasting scars of the cruelty he suffered in his old life. He is missing one eye ( although the vision in his remaining eye appears to be good), he has damage to his nose which was probably caused by trauma, only a stump left for a tail, various scars and markings and possibly he has fractured some ribs at one time. Sam however copes very well with it all although he still, understandably, carries fear with him, he is coming along in leaps and bounds. He’ll be a work in progress for his forever family as he will require lots of ongoing patience and understanding, particularly where strange men are concerned. His foster parents have also noted that Sam gets scared by loud noises and anyone wearing a hood or a hat. He enjoys his food and currently eats a dry complete kibble, but he can be nervous to eat at times so his foster parents tend to leave him to it, he will eat from his foster Mum’s hand but not yet his Dad’s. Sam is also doing well with his house training, he will let you know when he needs to go outside. 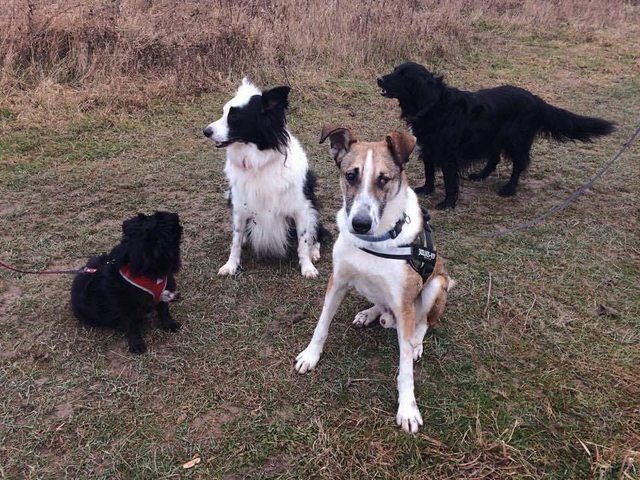 He gets along very well with his furry foster siblings both in the home and out on walks although he has lunged once at another dog while out on walks, his foster family haven’t had a repeat of that behaviour so far. 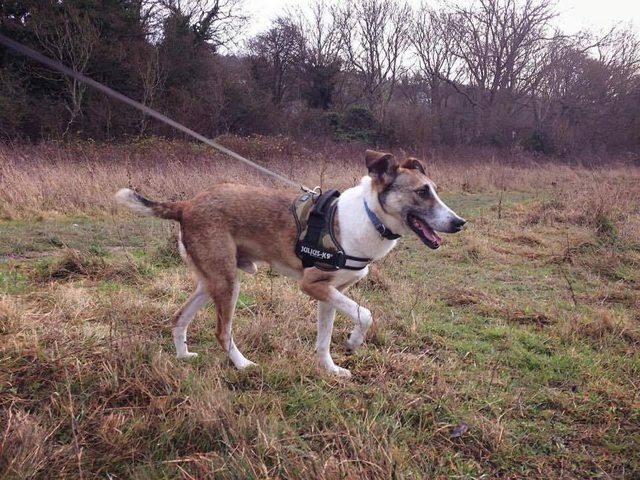 Sam thoroughly enjoys playing with the other dogs in his foster family, he loves a game of chase and leaping around with them, which is a joy for his foster Mum and Dad to see this dear boy having fun. So far, Sam hasn’t met any children or cats. Sam also loves his walks and gets so excited when he sees the lead coming out. He is strong but responsive on walks, he struts along proudly and relishes the opportunity for a good sniff. Toys….Sam can take them or leave them which is not uncommon for an abandoned dog who had absolutely nothing, but he is becoming partial to chew toys. It’s the same with car travel, Sam will settle down for a car ride but doesn’t seem to be particularly enthused at the prospect of a journey. Sam can be left for a few hours, this has been in the company of his foster family’s other dogs and he is fine with this. His foster family noted over Christmas that Sam did fret when his foster Mum popped to the post office for a short time but they think this is probably because he was visiting foster Granny and he was unsure in a strange place. This dear boy has come along in leaps and bounds since he’s been in the loving care of his foster family, but he’d really like a home of his own. He needs a family or person that understand the trauma he’s been through and help him work through his issues. A family that can offer him limitless patience, love and understanding, especially with his fear of men. Sam would be ideal for a family that realise he’s a work in progress but would enjoy showing him how wonderful life can be now and be patient with him when he needs it. He will be so very worth the effort as his foster family have discovered, thanks to them this boy has blossomed in a loving home, now all he needs is a home of his very own. Please email the rescue if you have any questions or are interested in adoption. We will do a home visit and ask you to sign an adoption contract. Our adoption donation is £225. 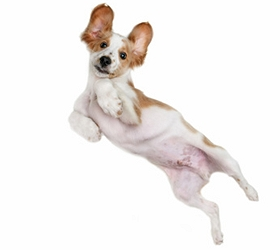 We don’t rehome our dogs to families with children under 10 years old.